The NSA’s image took a major hit when Edward Snowden revealed to the world the vast scope of their surveillance programs. The scandal centered around the NSA’s collection of “metadata”, which includes things like when and where calls or texts are coming from, as well as other passive information like where in a computer network certain data is coming from. William Binney was a career NSA employee. He was a leading code-breaker against the Soviet Union during the Cold War and was a high-level agent with the NSA when he left in disgust following the drastic increase in surveillance after 9/11. The most recent leaks from Snowden showed that the vast majority of the communications intercepted by the NSA are composed of Americans with no connection to extremism. 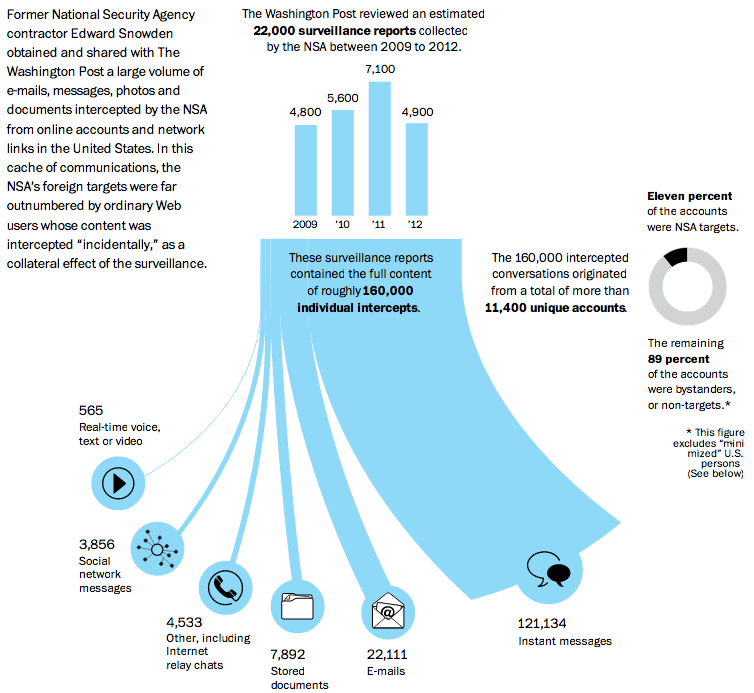 Of 160,000 individual intercepts given to the Washington Post by Snowden, nearly 90% were communications of bystanders who weren’t even NSA targets. Binney said at his appearance in London. He also pointed out that despite its vast surveillance capabilities and resources, the NSA was unable to foresee both the Russian intervention in Ukraine and he rise of ISIS in the middle east. You can also check out a recent interview that Binney did with RT News here. The FAA Just Approved The United States’ First Commercial Drone to… BP? So it comes as a surprise to most people hearing that the Federal Aviation Administration approved the first commercial use of drones to none other than oil mega-giant British Petroleum, better known as BP. The drone, designed by California-based drone manufacturer AeroVironment, made its first commercial flight in Alaska this past Sunday (6/8/2014). The drone is a Puma-AE (All Environment) model, which is actually one of the most widely-used models in the U.S. military. It measures five feet long and has a 9-foot wingspan. 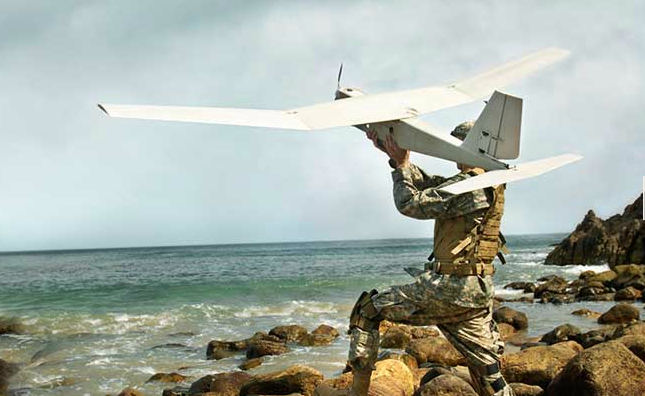 AeroVironment agreed to a five-year contract with BP. Though the drone will do some 3D-mapping and wildlife monitoring (as well as the occasional search-and-rescue mission), its main purpose will be to patrol hundreds of miles of oil pipelines in Alaska. One of the main reasons that the FAA gave BP approval for the drone is that it will be flying predominantly over uninhabited wilderness; using drones in urban areas raises many more questions about safety and privacy. Despite the fact that the National Transportation Safety Board actually ruled in March that the FAA had no jurisdiction to regulate small autonomous and remote-controlled aircraft, this approval suggests that the FAA intends to do just that. Read more from Gizmodo here. Just last month, the House gutted the FREEDOM Act, which was put in place after the Snowden revelations to prevent mass cellular surveillance of American citizens in the future. Internet and privacy activists alike have grown tired of the government’s empty promises about protecting internet privacy. So they decided to launch a campaign to take the issue out of Washington’s hands and put into the hands of the public. 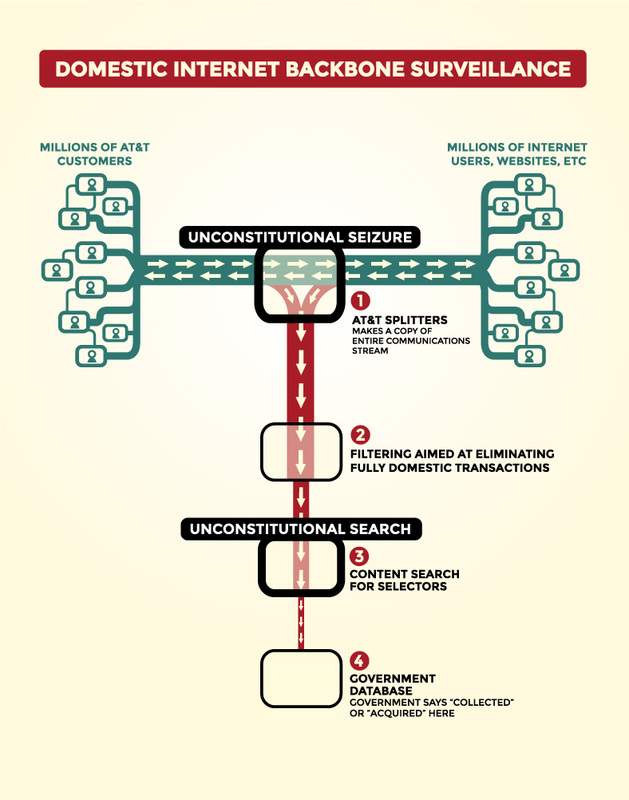 The campaign, known as #ResetTheNet, was initiated by Fight for the Future, and encourages websites and individuals to start using encryption to protect their data. It kicks off today on the one year anniversary of the Edward Snowden revelations of NSA surveillance last year. 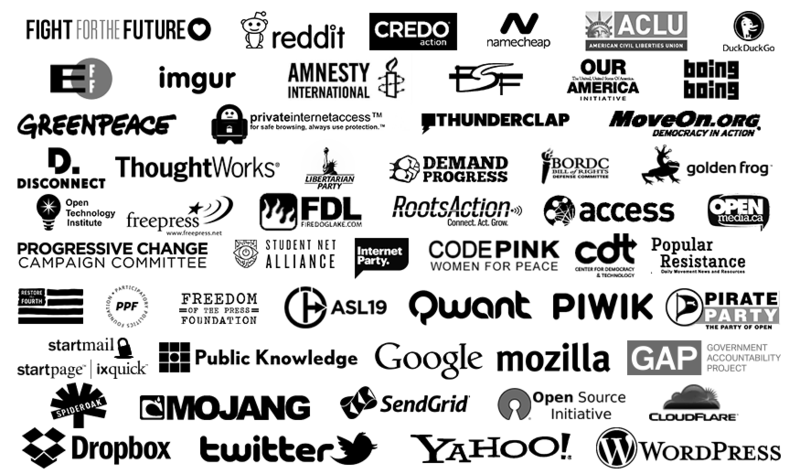 The goal is to not only educate people about encryption but to actually provide them with the online resources to begin encrypting their own information. The campaign’s splash page, which is displayed on many of the participating sites, includes lists of good encryption software and tips for both computers and mobile devices. While encryption definitely makes your data significantly more secure, it is not completely impervious- the NSA has whole departments dedicated to cracking encrypted info. However, organizers of the campaign believe that if encryption starts to become fairly common, the government simply will not have the resources to be trying to break through everyone’s encryption, forcing them to give up on mass internet surveillance. BONUS: The battle for net neutrality is also being waged right now. After approving a “fast-track” plan which would allow large corporations to pay for preferred real estate (ie. more visibility) on the internet, the FCC invited the public to comment for 120 days before they make their final decision. Comedian and political satirist John Oliver used his new HBO series, Last Week Tonight, to explain what net neutrality is, why it’s so important, and how the major cable companies pushing to make it happen are screwing the consumer. The massive comment volume following the airing of Oliver’s show crashed the FCC website for a while. This past Tuesday, The Higher Learning reported on an article from The Intercept which revealed (via documents released to them by Edward Snowden) that the NSA has been monitoring and recording virtually every single phone conversation in the Bahamas. In their article, The Intercept admitted that the documents named another country as also being monitored under this extremely invasive program, but chose not to release the identity of the country because they worried that the revelation would almost certainly cause deaths. The revelation has sparked worry amongst the intelligence community, who don’t believe that WikiLeaks has full access to the Snowden documents. It’s still unclear whether someone sent them a copy of the documents or whether they just got a tip from someone working with The Intercept. The leak site Cryptome even suggested that WikiLeaks may have just assumed that Afghanistan was the mystery country based off other already public information. I must say I don’t think many people will be shocked to hear that the NSA has Afghanistan under heavy surveillance. Personally, I think the surveillance in the Bahamas is much more odd and unwarranted. However, I do understand why The Intercept and Edward Snowden were worried about revealing Afghanistan. It’s highly likely that this revelation will be used to help fuel anti-American sentiment in the already unstable country. Whether or not that leads to violence remains to be seen. Read more from Time here. EDIT (5/24): WikiLeaks has released the identity of the mystery country. It is important to understand that here in the U.S. the NSA controversy was mainly over them collecting metadata, which includes info like locations, times, and where calls are going to and coming from. The program in the Bahamas records full-length conversations and stores them for 30 days before wiping them. On top of that, the program manually selects millions of shorter clips and sends them to long term storage, where they can be accessed even after the original full conversation has been wiped. 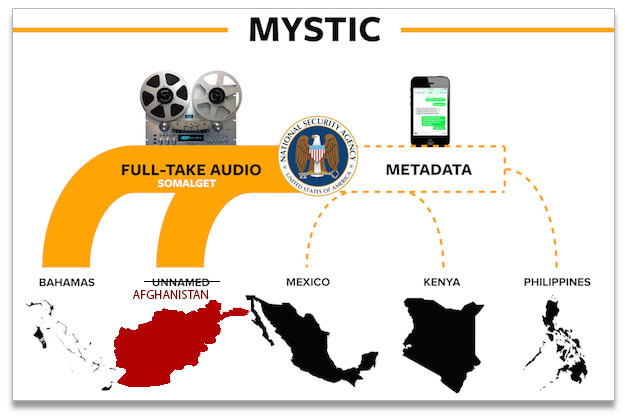 The program is part of a larger NSA program known as MYSTIC, which has also been collecting metadata from Mexico, Kenya and the Philippines. But the Bahamas are not the “big fish” for MYSTIC. Apparently, the Snowden document which revealed the surveillance in the Bahamas also listed another country that was being heavily monitored using SOMALGET. It seems that the revelation of this second country will cause some serious shock-waves though. Even Glenn Greenwald, who was the first person to break the original Snowden story to the world, said on his Twitter that they hadn’t revealed the name of the second country because they were “very convinced” that this particular revelation would lead to deaths. Despite the dangers, however, WikiLeaks announced on their Twitter earlier this morning that they will be revealing the identity of the mystery country within 72 hours. However, WikiLeaks isn’t believed to have full access to the Snowden documents, so whether or not founder Julian Assange will be able to deliver on the promise remains to be seen. Read more from the South China Morning Post here.